Eryn attended Bucknell University graduating with a BS in Biology. She was very involved at Bucknell, serving as an elementary school tutor and mentor, a Phi Sigma Honor Society member, and president of the Italian Club. As an undergraduate, Eryn conducted research on lymphoma and ovarian aging and infertility, eventually being published in Clinical Medicine Insights: Women’s Health. 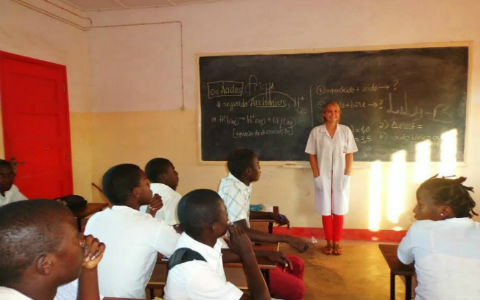 Upon graduation, Eryn joined the Peace Corps with the hope to rediscover her passion for serving others in a new way and served as a secondary school science teacher in Mozambique, Africa. “I chose GW because of the wide array of opportunities to work in global health, as well as the integration of public health into the new curriculum. I was a Peace Corps volunteer in Mozambique, where I continuously saw the desperate need for trained medical personnel who also had knowledge of the needs and limitations of the local community. My time in Mozambique, not only heightened my desire to become a physician, but also inspired me to pursue a career in international health.